The priests-in-training take this concept very seriously, often noting in interviews that the only reason for wins is simply for the tournament to keep going to the next round. They also insist that the main goal of the Cup is the opportunity to bond with all of their fellow priests and student priests, though they have been known to mention their position and their skill at playing it. The true tournament, they’ve assured me, comes after the Clericus Cup—the one called life. And as priests are the kind to get a little matchy-matchy for major holidays, clothing matters. Players’ jerseys mark the Catholic Church’s theme for the year. Last year was an extraordinary year of mercy, so the jerseys proclaimed in Latin that there was mercy on the field. But the players themselves have been known to sneak Bible verses into their cleats for a little extra help. Nuns studying at the Vatican haven’t started their own Rome Cup, so the issue has never come up. But the Vatican believes that sport is a human right. The clerics in charge of the Vatican’s Council for Culture have announced their support for women’s teams in several different countries on numerous occasions. Eventually, there will be enough global grassroots soccer support for all women who study at the Vatican to have had the chance to play. 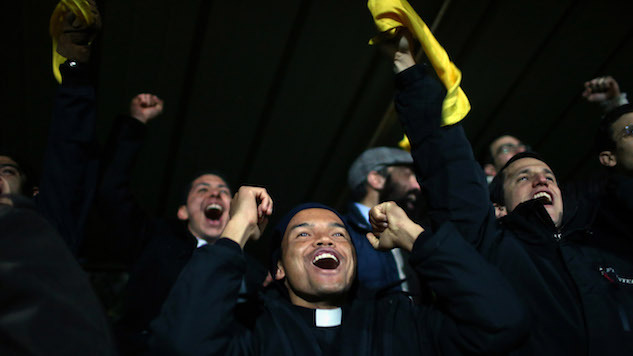 For now, there is a Vatican soccer tournament in which seminarians can play whether they are in their 20s or 50s. All come away with a sense of fraternity and possibly even world peace. They’re soccer players who just happen to also be training to be priests, all playing under the world’s biggest soccer fan: Pope Francis. This year’s Clericus Cup is just concluding group play. Current standings are posted on its website.